Gary Reeves was born in Gallup, New Mexico in 1962. He is the older brother of renowned silversmith Sunshine Reeves and the younger brother of David Reeves (now deceased), who was so instrumental in teaching the craft to both Gary and Sunshine, as well as their half-brothers Darrel and Andy Cadman. Gary has been smithing silver since the age of twelve. Gary's work, like that of his brother Sunshine, is present in the collections of the Heard Museum in Phoenix and Gary has won numerous awards for his work. 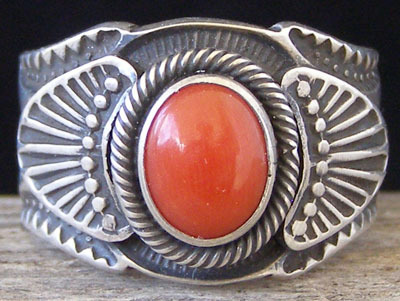 This deep-stamped ring is set with an oval of Mediterranean red coral. The shank is a little wider in front and tapers a bit towards the back of the shank. The coral is set in a straight-edged bezel wrapped with twisted square wire. This is a very solid ring made from heavy-gauge sheet Sterling. We won't re-size this, nor attempt to stretch it. Hallmarked "G.Reeves" in script and stamped "Sterling" inside. Red Coral: 3/8" x 1/4"
Width of ring in front: 5/8"